Some £27 million ($42.5 million/€34.5 million), 148 hours of rehearsals, but not one sequin. It's been a long, long time since that first audition way back in November. I have learned many things during that period. New phrases: for example "de-bibbing" (to remove the bib you are wearing) and "pre-stacking the vom" (filling up the entrance with the people who come on after you, before you then go in too). New skills: like taking a hedge down a flight of stairs in time to an insistent rhythm without falling over. New facts: granulated tea was invented by someone who had blatantly never tasted actual tea in their lives and hot chocolate stains concrete! I have also learned a lot about myself – my boredom threshold is seemingly quite low for instance. The following notes from my rehearsal diary might give you a taste of what it was really like to be a volunteer performer at what has been described as "the biggest show on earth." First two rehearsals on May 3 and 10 at Three Mills Studios (eight hours): My casting offer said very little other than I was in section 44C so I do not know what to expect or even what I am actually doing. 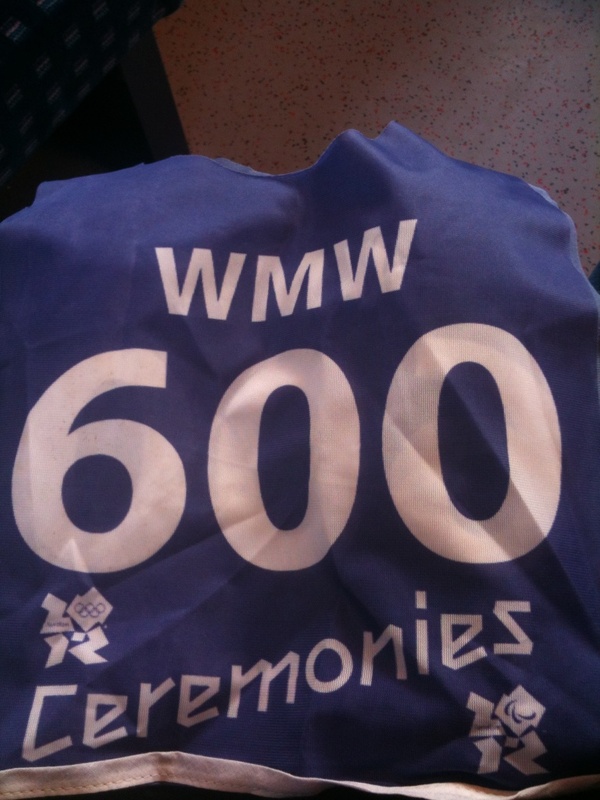 On arrival at Three Mills Studios we are all given Ceremonies passes, an Oyster Card to get us to and from rehearsals and bibs – everyone's is navy with the letters WMW – I am number 600. They are obviously concerned that as few details about the ceremony as possible get into the public domain and seem to have a code for each section. As we arrive we see a group of people emerge from another studio, wearing pale blue bibs with NHS on, all slightly out of breath and all keen to get their hands on some water. What have they been doing? There are about 250 of us there, and we learn that Group 44 will actually consist of around 1,000 people who are currently in four groups but will be brought together soon. Presumably 44A, B, C and D! Steve, the positive Canadian we met at the auditions, apologised for making us all feel like numbers but explained that when you were working with such large number of people it was the only way to do it. There was what looked like a scale model of the stadium in the corner of the room and pushed up against the walls were four or five numbered NHS beds, and one outsize one. Were we going to be pushing those, or riding in them? 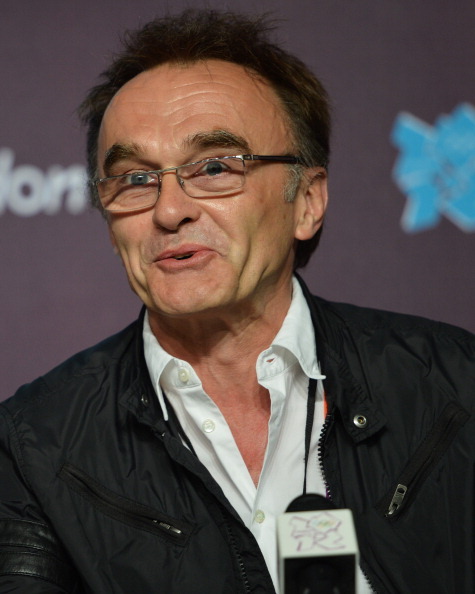 And then someone spotted Danny Boyle nonchalantly wandering into the room. He talked about how for a while their meetings had been quite corporate and all about what they could not do, but when the auditions started they met all of us, people who wanted to give up their time to participate, and we gave them a renewed sense of energy and purpose as they felt we embodied the true spirit of the Olympics (if it was just a line it was a great line – but he came across as very down-to earth and approachable). He took us through what we could see in the stadium model - there was a grassy mound at one end with a "stone" tower that was to represent Glastonbury Tor and rolling meadows across the main field area that would apparently be realistic enough to include cows, sheep and a cricket match being played. At the other end was a silver metal stage featuring a bell especially cast by a foundry in Whitechapel. Danny painted the picture of how that bell will outlive all of us and how it will only need slight retuning once every 300 years. The stadium looked beautiful. We were then shown a 15-minute film full of CGI and some live action footage, meant to illustrate our section of the Opening Ceremony. It is our job to make it the emotional experience that Danny so clearly envisions. During our tea breaks we were introduced to granulated tea – it doesn't really taste like there is much actual tea in it in my opinion. Looking around I realise that this group is mainly men – which bearing in mind they have been asking for more to audition is interesting. The age range is also in the older range – definitely not a lot of young fit dancers in our group! We learnt some basic arm choreography and had warnings about not telling anyone what we had learned, and that there had been reporters skulking around the nearby Tesco car park trying to wheedle information out of people. The men have had costume fittings and came back talking of rough hessian trousers, white shirts, heavy jackets and hats and boots, worried that in July they were going to be very warm! Some of the younger chaps were taken away to audition in front of Danny Boyle to be soldiers – they all came back excited at having had "acting lessons" from an Oscar-winning director. From next week our rehearsals are out in Dagenham – we were all issued with a set of khaki overalls apparently to protect our clothing from the dust and dirt in Dagenham and they make us look a bit like extras from a war film! Chatting to some people during the breaks it seems like quite a few are using up all their annual leave to be able to do this – I so hope it lives up to their expectations and sacrifice. I'm still waiting for a bit of glamour and a few sequins – looking at myself in my overalls that is quite unlikely! Eight rehearsals in May and June at Dagenham (40 hours): The weather varies from really cold to boiling hot – one week the overalls are great for an extra layer of warmth the next we are being given permission to not wear them for fear of fainting from the heat. We also get a lot of rain and so regularly shelter under plastic ponchos too. We have been issued with yellow gardening-like gloves – not for warmth but on the behest of the health and safety people who seem to be watching us like hawks, concerned that we might do ourselves a serious injury with all this scene shifting. London 2012 have a huge set-up at Dagenham, on the old Ford factory site, with two outside areas marked out to the same scale as the stadium so they can have two sections rehearsing at the same time. In-between are a couple of scaffolding tower structures where Danny Boyle and the production team sit with a high view of what we are up to and also a large circus style Big Top tent full of chairs, where we sit for briefings and during our breaks. They bus us to and from the tube station in a fleet of bendy buses – it is a strange sight to see all these khaki clad people on buses going through the streets. We are now one large 44 group so we are about 1,000 strong, but it doesn't look like that many people when we are in the area representing the size of the stadium – now referred to as the Field of Play or FOP. We are told we will be part of the world's biggest ever set change but every week how we do the scene change seems to alter – for the first few weeks we are dragging the turf, and then we are rolling it and lifting it as it is apparently creatively more pleasing to watch. One week all I do is lift a fence and carry it for about ten yards and put it down again. Three times over five hours. And every time we do a complete strike or clear our area, we then have to reset in order to do it again, and of course it takes far longer to bring everything back and put it in the correct position than it does to take it all off! It is very tiring, and with the travelling to and from Dagenham most people are just not getting any weekend break before starting their full week's work on Monday morning. We are organised into new groups or counties, some larger than others depending on which bit of the FOP we are to clear. We are Hampshire/county H. A rivalry between counties starts to emerge, and each county has its own challenges depending on what they have to strike – we are deeply grateful that we do not have any livestock in our section as the "debris" left behind would only add to the problems we have. Hampshire are led by members of the mass choreography team or MASS, Wendy and Soha, and our dance captain Emily, who all do their utmost best to keep our spirits up through all the many changes and alterations and do a great job of making us feel involved and needed. Because we spend almost all our time outside on the FOP there is nowhere to sit, so you have to stand for two or three hours at a time, something I find hard. Chatting to some of the group they appear a great mix of people – one works at a Russian bank, one is a doctor at his first (and it turns out last) rehearsal, one lives on a farm in Camarthen and starts her journey at 4am to get to the rehearsal for 10. One woman I meet has already started customising her overall a bit at a time – her way of rebelling against being a faceless number! We start to be issued with IEMs or in-ear monitors – radios with headphones that mean we can be given instructions without the audience hearing and so we can work to the soundtrack without the residents in Dagenham hearing the music – it must look quite strange to look out and see us all working and moving in time with no music! Danny Boyle is ever present and really supportive, coming down from the platform after one strike to says it looks "bloody marvellous". Even though we are regularly warned not to take photos of anything, many people seem to have their phones with them for a crafty pic, and Danny seems happy to pose for photos that are no doubt destined to become Facebook profile shots. All the standing around is the perfect environment for gossip and rumour – there is a basic understanding that we will have to leave directly after our section and not see any of the rest of the Ceremony, including the fireworks, but we've not been told this officially. There is also a feeling that we will not have access to any of the dress rehearsal tickets – but again we haven't been told this officially. In fact we haven't been told very much officially at all – most of what we know has been gleaned by one person chatting to someone from costume or casting, and finding something out and then feeding it back – creating Chinese whispers and misinformation as well as a feeling of being unimportant and unappreciated. Eventually there are signs of a small revolt amongst some of the volunteers – quite frustrated that the unofficial word is that we will not have access to tickets for the dress rehearsal someone is going around in the break persuading people to email LOCOG to ask if they can reconsider. Leaving one rehearsal I spot Danny Boyle being harangued by another volunteer performer about the possibility of dress rehearsal tickets. Later on that evening that same volunteer's face randomly pops up on my Facebook timeline, in a pic posing with Danny Boyle (presumably before the haranguing) as we share a mutual friend! I learn a new trick – if you ask for black tea in the break you get a real live teabag and can then add milk – so no more granulated tea for me! After a couple of weeks we get another group added to our section – 250 men wearing pink bibs with the letters CRW on, nicknamed the Warriors who are meant to help us wit the really heavy turf and structures. Every time they are called to the FOP as "Warriors" they all growl in response – it's very funny and their energy really picks up our spirits. One of them lets on to me that although the CRW on their bibs is meant to mean Crew they think it might actually stand for Can't Read or Write! At one rehearsal we get to work briefly with the people in the section before us – the MED bibs (for Meadow) who are the Green and Pleasant Land section – as they leave after their section they strike some things like maypoles before we turn up to strike the majority of it all, and they obviously need to leave the FOP before we all turn up so we need to make sure we are not bumping into each other. The drummers are also there and add some great noise and atmosphere. It's all starting to come together, but very, very slowly. The ladies get fitted for their costumes – mine is described as "spare weaver" – I will have a petticoat, a serge blue long sleeved dress up to my neck, an apron, a little hat and pair of scuffed boots. The costumes make us look like a huge raft of Dickensian extras, which I suppose we are! We are given our "show boots" to take home and wear in so that they are comfortable on the night. Quite early on we are requested to go back into the Big Top before "de-bibbing" – it's the first time most of us have ever heard that verb and we stare at each other in confusion! We are allowed to miss just two rehearsals before we are under threat of being dropped from the show – and there is obviously concern that a large number of people will choose to take Jubilee Sunday off so we have an email from no less than Danny Boyle offering us a present if we turn up on that Sunday. I am one of the slightly fewer number who duly do turn up and so am now the proud owner of a special Ceremonies T-Shirt. We have almost forgotten the choreography we learned at Three Mills as we have turned into stage hands lugging turf, hedges and fences around with no time at the moment to fit it in, although we are assured it will make a come back. I lose my iPhone on the tube home from Dagenham on one Saturday night and am totally delighted and very grateful to find that another volunteer on the tube had realised that it belonged to "one of us" and had brought it back to rehearsal on the Sunday. 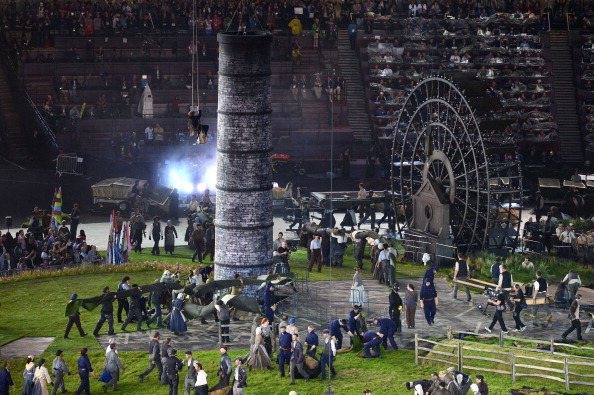 The unexpected press conference detailing the green and pleasant land theme and the stadium model we saw at our first rehearsals confuses many of us – surely the first rule of the Opening Ceremony is that you do not talk about the Opening Ceremony? Actually it might well be a masterstroke – if it keeps the press content then telling them the details of what is basically the pre-show means that they know practically nothing! I spend quite a bit of time looking at the press photos of the stadium model to work out where our Hampshire area is and what we actually have to deal with. 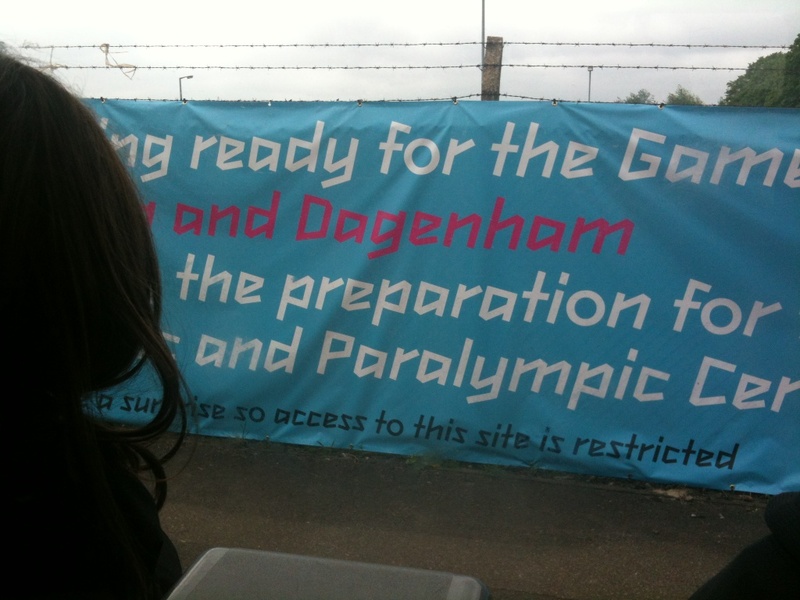 Despite London 2012 asking us not to check in to the site on social networks and to not tell people where we are, the local council has seen fit to produce a huge banner on the edge of the site proclaiming that they are delighted to be hosting the preparations for the Opening Ceremony – very Twenty Twelve. Nine rehearsals in the Olympic Stadium, late June and early July (55.5 hours): We are in the Olympic Stadium. The Stadium itself is quite superb – it feels so intimate, the seats on the other side seem so close that you could see people's face, yet when you stand in the middle it seems so large! We have been emailed with the news that we will be given two free tickets to the second dress rehearsal for family and friends, we are not able to use them for ourselves as we would not have time to get out of costume and into our sets, so we will never see the show other than on TV as it has also been confirmed that we are expected to leave the Park as soon as we can after our segment has finished. Security is much tighter than it was at Dagenham, and because there is nowhere to purchase food we are now being given lunch packs – a smallish sandwich, pack of Pringles, a Nature Valley cereal bar and a piece of fruit. Some of the Warriors look a little hungry after gobbling it up! As the weeks progress the sandwiches get larger until they are really huge doorsteps. One week we even get a small bar of Cadbury's Dairy Milk but that sadly never reappears. After two weeks hot chocolate is withdrawn from our tea breaks – a lot of drinks are apparently being spilled as we sit in the seating bowl to eat our lunch and hot chocolate in particular apparently stains the concrete steps! They make the mistake of introducing granulated black tea and not having tea bags at all, but finally give up the battle and granulated tea disappears entirely to be replaced by tea bags proper. Us Brits know what makes a good cup of tea and what does not! Everything is all change again now we are in the Stadium, we have been rehearsing on a flat surface, but of course the real FOP is raised in the middle, and has steep stairs down making it more difficult than we had fooled ourselves into thinking at Dagenham. This makes wheeling the hedges in particular a total chore, as it now takes two people to lift one of the very heavy real hedges up and carry it down the stairs. The counties with real turf are finding it so very much heavier than they expected too, especially when it rains which it does a lot. The first week we find it all very demoralising, it takes us so much longer to strike and we feel we have gone dramatically backwards. In the second week we are introduced to the wonder of hedge slides, which have been especially made to fit at the edge of the steps. I have never known my mood be so altered by being given something I never even knew I wanted – I am actually bouncing home with joy after realising how much easier they make the hedges!. During one early practice on the hedge slides I hear someone say "well done girl" as I get to the bottom with my hedge and look up straight into Danny Boyle's face – I was just so shocked to see him I went completely blank and have to hope he thought I was brilliantly staying in character! The real Tor looks awesome and seeing the Warriors come out is incredibly impressive. Our first sightings of the chimneys and other machinery coming out of the ground is also hugely exciting – until we see the following morning's papers. A helicopter had flown over during our rehearsal and a couple of papers have chosen to use the photos, although they have made some grossly incorrect assumptions about what they were seeing. We have all tried so hard to keep the details of this a secret so this is very frustrating. The #savethesurprise hashtag starts appearing on volunteers tweets, is soon retweeted by Seb Coe and gains a life of its own. The following week it is emblazoned on the screens in the stadium during the rehearsals, although some papers still seem determined to ruin the Ceremony for people. Hampshire are clearing the section directly in front of the Royal Box, it feels somehow wrong that the way we bend down to roll and pick up the turf means that very often we are waving our bottoms in the air in her direction, but it can't be helped! We are spending more time with other groups who either precede or follow our section and are learning more snippets about their sections and what they know about other ones, we still know tantalising little about the whole show and have yet to really see any of it. Listening in to other groups on the IEMs is also intriguing as you try and piece together what might be happening based on the cues they are getting. The rain is incessant and heavy. The drummers complain of "stadium flu". Every time a piece of astro turf is rolled and carried dirty water pours out of both ends and down the sides of the people carrying it, getting everywhere. We are told that because we have never run our section in the same conditions twice we could now do it "even backwards and in high heels" – although Health and Safety would be bound to have something to say about that! After a couple of weeks I notice huge bruises on the backs on my calf and realise they are caused by the flaps on my hedges hitting my legs as it runs down the slide. There are a couple of minor accidents that need an ambulance to be brought into the stadium, thought neither are hedge, turf or fence related. Danny Boyle gives us a couple of motivational speeches, to put the section we are in into context and to urge us on to make it work. After rumours of cuts flashed round the Stadium, in the way that gossip has seemed to, he explained how they had had a difficult meeting the day before but that he was determined to not cut any volunteer sections, just shave some time of each one as the show was overrunning slightly. Obviously our section could never have been cut completely, or else all the other section would be performing on grass and hurdling hedges in order to dance so we were always safe. We just have less time to do it in. Our first strike was therefore total panic as we had two minutes of music cut out of 17 and it was a mad scramble to get everything struck in time. We did it by the skin of our teeth and will have to make it better in the remaining time we have. After one rehearsal we are excitedly told about a "swag bag" that is waiting for each of us – it turns out to be another tee-shirt, just like the one those of us who rehearsed on Jubilee Sunday were given a month or so ago – rather negating the exclusivity of the first tee-shirt because now everyone has one. The rehearsal schedule has actually finally given us a couple of Sundays off – the first since May. Most of us are so tired we just sleep, however some people admit to doing the cleaning they have not had time to do for weeks. We are getting quite blasé about our access to the Olympic Park and have to keep reminding ourselves that we are in THE Olympic Park, and THE Olympic Stadium and how lucky we are. None of the other three ceremonies will get to rehearse in the stadium at all until the day of their show – we have been very privileged. Sometimes when you are lugging around a piece of heavy wet turf or dragging a hedge it is difficult to remember that. Three rehearsals at the Olympic Stadium and Eton Manor in July (30 hours): Very late in the day we discover that from now on we will not be based in the Stadium but would be at our new "holding area", Eton Manor, in the far end of the Olympic Park. It is primarily a Paralympic venue but they are using it for a large number of the Opening Ceremony cast. A lot of people didn't get the late night email informing them of the change and so were unaware that they were in for a long walk. Eton Manor is 1.6 miles from the Olympic Stadium and is also just over 1.6 miles from the entry gate near Stratford station. This means we have to walk to and from it four times during the course of a day – over 6.4 miles. Our group is not made up of young fit dancers, and we already do some actual heavy work as part of our segment – being told this so late has really demoralised a number of people. Especially as there appears to be no clear provision for anyone who might find the walk a challenge. Remembering how much Health and Safety were so concerned about our segment at the beginning of the process it seems daft that no-one thought to ask if a 6.5-mile walk would be too taxing for people. Over the course of a number of days a lot of people raise their concerns, supported by the costume team who see how exhausted some of us get when we get back from the Stadium, and after a couple of disagreements which cause two people to be asked to leave the cast (not in our segment apparently), a system of mobility buggy rides emerges for those who are the most in need but there is another large number who soldier on despite pain in true British spirit, spending two extra hours walking back and forth from our new holding area, even though they find it a struggle. It's taken the shine off the last few weeks for a number of people, who are now extremely tired. It's such a shame as with some forethought and way better communication, this could all have been avoided. We have been hived off from the men in our section, as we are now seated in a section of a large tent that is our changing area. Our section is next to the female dancers and looking at the racks and racks of costumes I suddenly develop a huge amount of sequin envy – we have NONE and they have their share, our share and way more! People are desperately trying to stay behind after our section to watch what follows. Depending on who is monitoring the seating people sneak into some have been lucky and seen a lot, some have seen nothing. 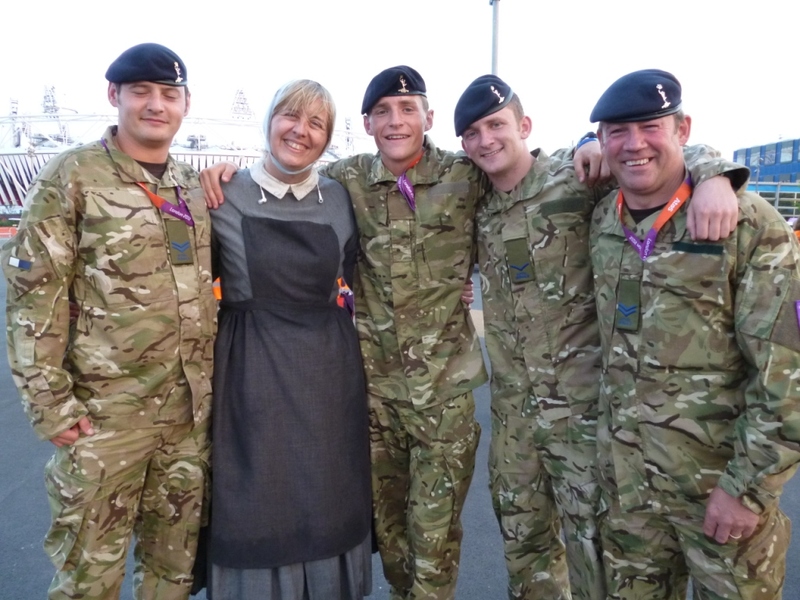 Some of the Warriors ended up being flag bearers for the Athlete Parade rehearsal on Friday night, as they stayed behind to watch and were then needed as extra bodies. We are now being given two meal bags each, as we are here for such long days and late into the night. There is some serious Pringle and Nature Valley fatigue evident. And still lot of hankering for some Cadbury's Dairy Milk, or something cool like an ice cream or a cold drink that isn't water. None is forthcoming. Costume are very confused that none of us appear to realise that Saturday's tech rehearsal is considered a dress rehearsal too, not everyone has brought their show boots for example – but it has not been made clear to us that this was the case. The first full day in costume in the holding area is quite surreal – Industrial Revolution workers pose for photos with Ziggy Stardust dancers and nurses on every corner. People we have worked with over weeks of rehearsals look so very different when dressed in their outfits. Finally we appear to be being trusted with photographs, we are now so close surely they know we are as determined as everyone else not to leak any details until the night? Or perhaps everyone is just so very busy that they don't have time to tell us off any more. I get to pose for a pic with a dancer friend – she describes her costume as "70s green disco lizard" – and we look so random standing next to each other! We have plenty of time for photos as we have been called to the park for 2pm, yet we do not need to be in costume until 7pm for a 9pm show. Various games of Pringle lid frisbee break out to fill the void, and people are soaking up the somewhat unexpected sunshine. Danny Boyle appears in the dressing room to say hi (just my luck to have hidden between two racks of clothes in order to put my Dickensian petticoat on, as he appears from the other side of one of the two racks!). Seb Coe is also spotted in Eton Manor and spends a lot of time signing things and chatting to people, telling them he is coming to the tech rehearsal that evening. The closer we get to the actual Ceremony the less time we get to spend in the Stadium. From being in there for hours on end last month we now turn up shortly before we enter and our section feels over in a flash. In a calm moment on the way back after the tech rehearsal some of us comment that it strangely feels like OUR park now, and that there will be people here next time, "invading" our park. They will be our first audience – will they understand what we have been working towards? First dress rehearsal in the Olympic Stadium and Eton Manor (7.5 hours): We are called at 3.30. It is incredibly hot. Far too hot to be sitting in two layers of Dickensian costume in a tent so everyone puts off getting into costume until we absolutely have too. We have to blacken our faces too and the heat just makes it run straight back off. Apparently some of the dancers went home on public transport in their costumes last time and are told to not do it again. How is that #savingthesurprise? They do finish very late, as we are running the rehearsal at the same time that the real Ceremony will take place on Friday, but without the extra provision of late trains and tubes, so presumably could not face the half-hour walk back to change and the half-hour walk to the tube after that. And suddenly we are being called to go the Stadium. Walking through the Olympic Park en masse is stupendous. A thousand Victorian mine workers, striding past surprised journalists and Games Makers. We can hear Danny Boyle over our IEMs, telling the audience that the volunteers are what makes the show, and to please save the surprise for everyone on Friday. We are led into our entrance, we can see straight into the stadium, we can hear the crowd, and then we're on, and for 15 minutes you are concentrating so terribly hard to make sure that you get it all right, that everything is cleared, that people struggling with heavy turf get extra help, that you hear the cue to start the choreography, that you stay in character, and then you are standing looking up at the Olympic Rings raining fire down onto the FOP and the place erupts in noise. And then you are off and on your way back round the outside of the stadium, and the long walk back to Eton Manor, knowing that those lucky 60,000 people are seeing parts of the Ceremony you will never see live, and they have seen so much more of your segment that you have ever had time to be aware of. When I get back to Eton Manor I check my phone and see that #savethesurprise has been a global trending topic. For a dress rehearsal! Looking at the comments on Twitter I think we are a hit! Only two more performances to go. Final dress rehearsal in the Olympic Stadium and Eton Manor (7.5 hours): It's still hot! The sandwich flavours on offer today include the somewhat random carrot and hummus – it doesn't seem that popular. Today's warning is to remind people "not to answer their phone during the show" – as apparently one Warrior was spotted doing this during our segment on Monday! There are times when words fail me and this is one of those times. Walking in the Olympic Park has never looked more lovely – the flowers are coming into bloom at just the right time and it is ready for action. We have to let it go, pass it on to the athletes and ticket holders who will hopefully come to feel as at home here as we have done. This whole experience is becoming more and more surreal. 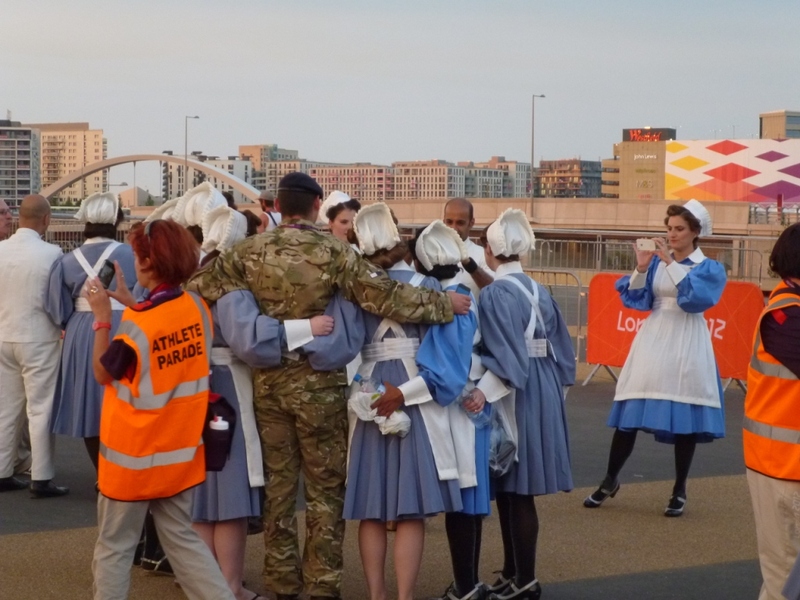 I am waiting in costume at the Stadium early, and warn some nearby soldiers who are just about to leave that if they wait just five more minutes they will see one thousand nurses walking past, as I know the NHS section nurses arrive and get into position before we do. They disbelievingly wait, and then suddenly they are surrounded by nurses, and not only do the soldiers want to take pics with the nurses, but the nurses want pics with the soldiers! It's all good-natured chaos with photographers and TV crews also trying to capture the moment. Just as the nurses parade passes by and the Industrial Revolution parade starts to arrive, and I am about to join in on our journey to the Stadium , the Irish middle distance runner Sonia O'Sullivan runs past on a training run through the park in her green running gear, happily waving at a couple of people who shout "Hello Sonia!" And Sue Barker is then spotted walking past on her way to the BBC studio just behind us. Probably the most bizarre scene I will ever witness. If I thought the last dress rehearsal went by in a flash this one was even faster. It seemed only seconds until we were back out of the Stadium and walking back to Eton Manor. The whole thing passed in a blur. Walking back I hear people share their experiences: "Did you see they all stood up during the poppy moment, every single one of them? ", "They were so LOUD", "I don't think I was in time with everyone else I the combination sequence". Now we have an audience the catering concessions by the Stadium are open, and some people are buying beer to drink on the long walk way back. It's the smell of fish and chips that has been calling me for the last two nights, but I have found the will power to resist. That, and the fact that the boys have pockets in their trousers but the girls do not have pockets in their dresses so there is nowhere to safely put any money! The final realisation on the way back is that as we return to our holding area on the actual night, we will be walking past the athletes in the athletes' parade who will be waiting on the same path to go into the stadium. We might not get to see them go round but we'll certainly see them waiting outside! The Big Day dawns after 148.5 hours of rehearsals: We have been sent an email saying that we will all be getting a certificate and a copy of the Opening Ceremony programme, which apparently has all our names in it! We also get to keep our costumes, unless they were specifically hired for the occasion, I assume it saves on storage and disposal costs. Watch out for various costumes appearing on eBay early on Saturday, they all appear to have London 2012 logos on the labels. The weather forecasts for the last two days have all been about the Opening Ceremony, and have slowly changed from rain at 9pm (just typical) to maybe no rain at all. Even if it does not rain during the performance, any rain during the day will make our job harder as the turf and hedges, already set up waiting for us in the Stadium will be wet and heavy. We will cope with rain, we've had a lot of experience, but the dancers and other sections that follow us really don't need it. We are all crossing our fingers. The various Facebook groups that have evolved over the rehearsals, some more closed than others, are full of volunteers' excitement, and snippets of feedback from their friends who saw the dress rehearsals, as well as TV footage from around the world who have captured us walking to and from the stadium. One piece shows a Chinese reporter who is suddenly kidnapped midway through speaking to camera by some of the dementors in the NHS scene as they walk past. She professionally carries on delivering her report as she is whisked out of shot! A number of volunteers have used GPS on their phones to map their progress around the stadium during our strike, and they have posted their maps up to show us their routes. There are a large number of after -parties and gatherings for different sections of the volunteers, all organised by us to try to capture the afterglow of our experience and to see if we can still be in the area to see the fireworks or get to a TV to catch the end of the Ceremony. There is talk of a flash-mob of performers sometime next week too, but most people are not thinking beyond tonight. The papers are full of lists of the great and the good (and not so good) who will apparently be in the Stadium tonight watching us, and ridiculous estimates of worldwide television audiences – it is mind boggling, I really can't take it in. At the end of our first audition, Steve told us all to close our eyes, imagine it's the evening of July 27, and that you are about to step into the Olympic Stadium. Then I felt incredibly excited, but now I feel unrealistically calm. Seven years ago, as I stood in Trafalgar Square and celebrated with thousands upon hearing Jacques Rogge announce "London" I determined to volunteer for London 2012. I never dreamt that my involvement would or could be this. For those of us who will never reach the sporting heights of the athletes who will follow us into the stadium tonight, who have grown up watching previous Opening Ceremonies with a sense of awe and wonder, tonight is OUR Olympics. Tonight is our chance to represent our country to the world, and to prove that all the time spent waiting, all the times we got soaking wet and felt miserable, tired and downheartened, all of this was worth it for our moment to shine, our moment to show Britain to the world. Our 10 minutes in our Stadium, with the whole world watching. 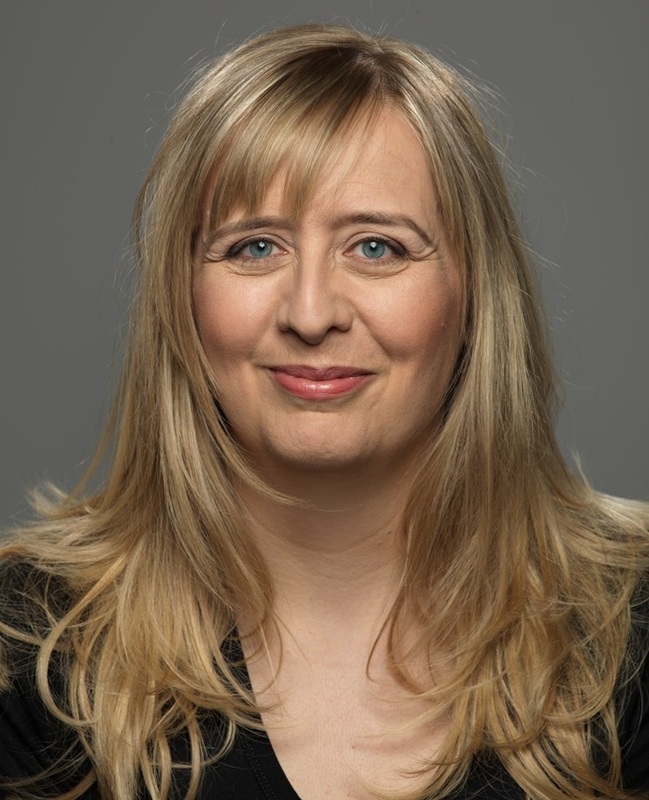 Louisa Gummer is the social networking manager of insidethegames.